Just as summer began blossoming in southern Norway, 28 Augsburg faculty members, students, alumni, and friends of the College immersed themselves for 10 days of study and cultural touring in this country so closely tied to Augsburg’s historic identity. 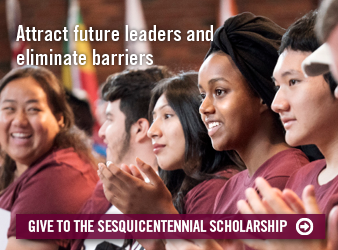 The customized program was developed by the Augsburg Center for Leadership Studies in partnership with Diakonhjemmet University College (DUC) in Oslo. Organizers set out to meet two goals: introduce more people in the Augsburg community to modern Norway and build stronger academic and interpersonal relationships with DUC. This presentation as an Augsburg Now Web Extra offers images and interpretations of the June 5-10 study and cultural tour, as seen through the camera lens and in personal reflections of some travelers. The presentation covers three themes that emerged in our observations: Norwegian identity; war, remembrance, and peace; and cultural comity and consensus. Professor Doug Green and Glenda Holste, MAL ’05 wrote and edited this Web Extra. Photos are by Lucinda Hruska-Claeys, MAL ’10, Warren Park, and Pete Holste. You can’t reduce Norway to mere facts. It’s not enough to say that it has 4.8 million people—relatively close to the 5.2 million in Minnesota, its historical American counterpart, though Norway’s population is scattered across a much larger area. It’s not enough to say that it’s one of the wealthiest countries in Europe, when for centuries it had been one of the poorest. It is still one of the least diverse, despite new immigration and its worldwide reputation as a vocal advocate for human rights. Neither is it sufficient to laud its anti-Nazi resistance without remembering the quislings who welcomed the invaders. The Norwegians we met at seminars and on the street are, by their own admission, both fiercely independent (and hence suspicious of greater Europe) and slothful—waiting to see what their country can do for them and expecting it to deliver. With its small population and high standard of living, it is a virtual oil oligarchy, in love with the luxuries its newfound wealth can buy, but also a society that is squirreling away its revenue for a rainy day. Norwegians are romantics, deeply in love with the varied, jagged contours of their rugged land. But Norway is also a nation of rationalists, who debate what the good society is and then develop policies to produce it, and a community of doubters, who question their own intentions. They are self-interested and selfless, true believers and apostates, romantics and dour stoics. This June’s Educational and Cultural Tour of Norway, sponsored by the Augsburg College Center for Leadership Studies, afforded two main routes into the paradoxes of modern Norwegian identity: the background we received through our colleagues at Diakonhjemmet University College and our travels, guided by Lisbeth Lindback, through Oslo, Bergen, Stavanger, and the countryside along the way. Sometimes we found it difficult to separate the two: What we heard about Norway’s communitarian policies, as we might call them, seemed realized in some public spaces, like the magnificent opera house on Oslo’s harbor, which serves simultaneously as a home to high art and as a public gathering place, or like the breathtaking design and sculptures of Vigeland Park. In fact, Vigeland Park may be the perfect emblem for Norway: it was the life’s work of Gustav Vigeland, one of the great sculptors of the 20th century, and a mammoth public project—a synthesis of individual and governmental efforts. Vigeland’s sculptures of children, men, women, couples, and families are at once warm and monumental and moving in both senses of that word—as if Gaston Lachaise’s heroic figures had been reinterpreted and humanized by Bernini. 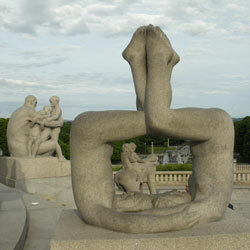 Vigeland’s design for the park is classical with neat symmetries converging on a central obelisk, yet the lush setting and animated figures have been touched by the baroque spirit, if not the outright romantic. Professor Hans Morten Haugen raised ethical and political questions about the tensions in “Norway’s Leadership in International Peacemaking and Development Work,” particularly the shift from aiding the poorest countries to aiding the most strategic countries in need of help. As we learned at the Nobel Peace Center and later at the Directorate for Development Aid, many Peace Prize recipients and even the best intended aid policies have proved controversial. While such controversies are not unique to Norway, the rational analyses and intelligent public discussion of such issues are refreshingly different from the sound bites that increasingly characterize political discourse in much of the West, especially in the U.S.
About one aspect of Norway, however, everyone agrees: It is a stunningly beautiful country. On our journey from Oslo in the east to Bergen on the western coast, we passed through Geilo’s stark hills and lush valleys to Myrdal; took the steeply graded rail line from Myrdal down to FlÃ¥m, gasping every time we emerged from a tunnel to visions of emerald vales and rock-strewn waterfalls; and cruised the placid, brackish waters of an inland fjord surrounded by glacial falls and rugged cliffs. 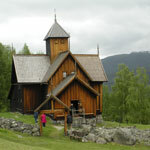 We entered the remarkably well-preserved Uvdal stave church from 1167, still used for weddings. We were introduced to its long history by a young man who still marveled that he had been baptized in its aged wooden baptismal font. We visited a wildlife park with endangered wolves, polar foxes, reindeer, and wildcats. But the old seaports of Bergen—with its Hanseatic Museum and U.N. World Heritage wooden waterfront buildings—and Stavanger, with its lovely old cathedral, equally impressed us. One ancient artifact perhaps best embodies our foray into Norwegian identity: an excavated Viking ship. The ship reminds us not only of the notorious violence, range, and daring of Viking raids and exploration, but of the culture’s accomplishments in arts and crafts, so evident in the ship’s design and the elaborate scrollwork ornamenting the prow. Norway is still like that—a land and a culture of striking contrasts and enduring beauty. The last words in Norway’s Resistance Museum exhibit explain the small country’s huge commitment to peace and targeted international development: Aldri mer. Never again. “I learned about what a deep effect World War II had on Norway. I saw evidence of great pride in the efforts of the resistance movement, mixed with complicated emotions toward both the Norwegians who collaborated with Germany and Norway’s subsequent punishment of the collaborators. There seems to be such an awareness of the dark and complex nature of the whole episode. This introspection about the effect of war struck me as being particularly pronounced in Norway. Norway’s painful experiences during World War II may in part nurture the country’s commitment to finding peaceful solutions to conflict. Our group’s visits to the Resistance Museum at Akershus and the Nobel Peace Center illustrated these two aspects and their role in shaping modern Norway,” said Patty Park, an MAL alumna and MAL co-coordinator. The Norwegian equivalent of the U.S. Pentagon, the military complex around Akershus Castle by the Oslo Fjord, holds the modest museum in the heart of today’s bustling defense establishment. 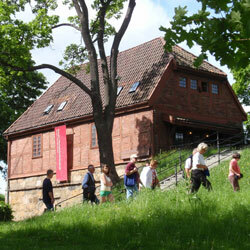 The museum building is tucked into a battlement next to where the Nazi occupiers executed Norwegian resistance fighters. 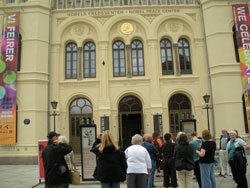 A short bus ride away, Oslo City Hall and the Nobel Peace Center define Norway’s unique role in a global quest for peace and humanitarian vision. The grand ceremonial room where President Obama received the Nobel Peace Prize last December keeps history alive with murals of heroic scope, all by Norwegian artists of the 20th century. Outside on the day we visited City Hall, modern Norway was showing its stuff, too, in a display of cars that use little or no fossil fuel. Then. Now. Going forward but never forgetting Norway’s strategic interest in peace-making. Professor Haugen explained the strategy for choosing where and how Norway invests about 30 billion kroner a year in development. That’s 3% of gross domestic product. All of U.S. foreign assistance outside of military objectives amounts to less than 0.05% of GDP. Norway sees the outreach as an investment, part of its national “branding” as well as the right thing to do. Norway is a rich country, doing good for others but with its self-interest in mind. Then there’s domestic self-interest, or the Norwegian Model. On the day we visited the Opera House in Olso, workers were striking the place—just before opening night of a big production. The object of their negotiation with management—the government—was to equalize pay between men and women workers. A strike represents a failure of negotiations in the U.S., which has a relatively small number of workers represented by unions and the bargaining process can be contentious. In Norway, a strike is more theatrical than substantial, just part of the conversation over how to distribute agreed-upon resources. Yes, Norway does things differently, we learned at HSH. The national government agency adds up to a sort of combination commerce and human resources department. Business, government, and workers are viewed as three equal entities in making the economy hum along. Gry Myklebust, a chief adviser at HSH and an attorney, put it this way: “We think it is quite important [for business] to collaborate with government and unions. Besides the cultural cohesion involved, union density in the workforce is 53% while 70% of Norwegians are covered by some kind of collective bargaining agreement. In the U.S., union density was 12.3% last year. Call Norway’s economic cooperation part of the culture that values comity above contention. Or call it the easy way to consensus. Back in Minnesota, the buzz has begun about Norway II while in Olso, our host Professor Vetvik of DUC, reported that he’s writing a book about the experience from his perspective on the partnership. Meanwhile, its pictures, e-mails between new friends and dreaming about next time.